The 650 residents of the Fernleigh and Annfield estates in Carpenterstown have recently turned their backs on the waste disposal services of Fingal County Council and signed up with a private refuse collector – City Bin Co. Ltd. The deal which is worth over €120,000 per annum to the private operator has lead to some recriminations among local residents following the recent withdrawal from the estate by the county council. The chairperson of the board of directors of the Fernleigh Management Company Ltd., Cathal O’Donoghue told Community Voice that the decision to change was made after much discussion by the board and following a detailed tendering process. Community Voice has seen the minutes of the annual general meeting of the management company at which the decision to move to a private operator was taken. A total of 25 residents out of a possible 650 attended the meeting. The management agents for the estate advised the meeting that they had received a number of views and letters from owners opposing the new system being proposed by the board. However after discussion the meeting agreed by 14 votes to 9 to enter into a contract with City Bin Company at an annual cost of €185 per dwelling, to be paid through the annual management fee. A number of individual residents subsequently contacted Fingal County Council seeking a continuation of the local authority service. Initially the council wrote to residents offering to continue to collect their waste. However after subsequent legal advice they withdrew the offer and took back all bins previously supplied to residents. According to a spokesperson for the county council, “although we would be happy to continue providing a waste management service to residents in Annfield and Fernleigh we have received legal advice confirming that the estates are private and therefore the Council are no longer entitled to provide a waste management service without the consent of the management company. “For this reason all residents in those estates can now only avail of the service being offered by their management company through the managing agent and pay any charges which apply as directed by their managing agent. 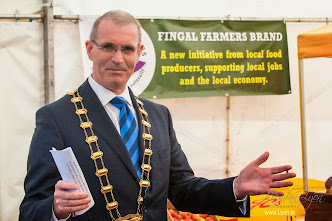 Fingal County Council has no involvement whatsoever in this arrangement,” said the spokesperson. One issue raised by a couple of residents is the question of waivers for those unable to pay their refuse charges. Such waivers are available to users of the county council service but are generally not offered by private operators. However according to Mr. O’Donoghue, “my understanding is that a waiver agreement is available from City Bin Company.” However a spokesperson for City Bin Company has confirmed to Community Voice that it does not operate a waiver scheme. The matter has been raised by local Fine Gael candidate Kieran Dennison who is seeking a council seat in next year’s local elections. He has called on the council “to admit they’ve got it wrong on the bin charges and to introduce a fairer pricing system. At a conservative estimate the loss to the council of these two estates alone will be at least €150,000 per year. The Council simply cannot afford to lose this sort of revenue at a time when their income is already under pressure from a severe reduction in development levies and the 6.93% cut in Government funding in the Budget,” he said.